This step-by-step ebook course is the answer for those of you who want to jump-start their performing career. Even those who are doing well will gain additional business if they follow this system. You will put yourself in front of people who will want to hire you for their corporate or private events and make money while you're marketing yourself to these people. It does not matter what it is you're marketing or whether you're a corporate entertainer, birthday party magician, hypnotist, etc. Imagine... you could potentially book yourself solid for the next week within minutes after reading through this ebook. Mentalist Robert Marsi has conquered this virtually "untapped" market that allowed him to book shows and make hundreds of dollars instantly in a single setting. You make money while you market yourself to potential clients! And the best part of all this? You do not need promotional materials to book these gigs! They are very easy to book. No marketing expense whatsoever except the cost of a phone bill. You can book your shows from the comfort of your home using your telephone or smartphone! Included in this ebook is how to book yourself, getting ready for your show, the #1 technique to get rid of stage freight, getting up to do your show, making the money at your show, using the power of media at your shows to turn you 'famous' overnight, and a whole lot more. In the end, what you achieve for yourself is exactly the amount of work you're willing to put into it, and the information contained in this ebook will help you along the way. 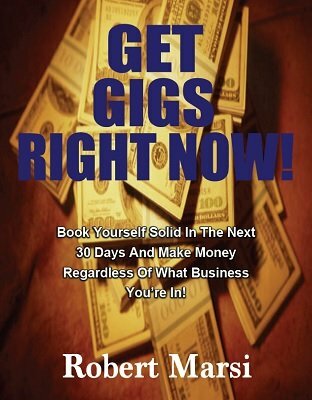 Get it now... or watch your competition make money and get booked for higher paying gigs using these strategies! 1st edition 2013, 52 pages. Sorry, But what a load of crap for the money. The first 6 pages are fluff. The next couple deal with booking a show. After that, well, it's nothing that the very average preformer already knows. If I could, I'd ask to get my money back for this product. As a performer that's always looking for ways to gain more exposure to potential clients, I decided to pick up Robert Marsi's book to see what I could learn. I figured if it even helped me land one gig, then it's paid for itself. It's not a system where you can expect to make a ton of money right at the start. But it truly is a system that will get you immediate gigs in front of potential planners that are looking for someone just like you. In fact, using the resources he provides in the book I sent out about three dozen email inquiries to different groups. In two days, I booked two different speaking gigs were they were in fact practically begging me to come talk. Nice thing about these gigs is that they are middle of the day events when I typically don't have any performances going on. I'd recommend this to anyone looking to build up a potential client base and get yourself known, especially among those people to have a high potential to need you again later. Decided to take a chance on this e-book and see what I could learn. Very easy formula for getting yourself in the public eye of those people that do have the ability to hire you, no matter what level you currently are at. From the very new performer, to the experienced we can all use more exposure. This book gives you the steps and the resources to find those individuals that are looking for you. After reading the material and doing as it instructs I sent out a few dozen emails, two days later I had two gigs booked when the planners called me back. If you're looking for ways to get noticed and get yourself out there to more potential clients I would recommend this e-book.